Pickles are a common sight in every Indian's home and especially at my place. Mom and granny make a lot of varieties of pickles. Infact an entire rack of my fridge is filled with pickles like mango pickle, onion pickle, lemon pickle, ginger pickle and so on..
Now this gooseberry pickle is the new entry and for sure one of the best :) yummm.. its simply too good with curd rice. 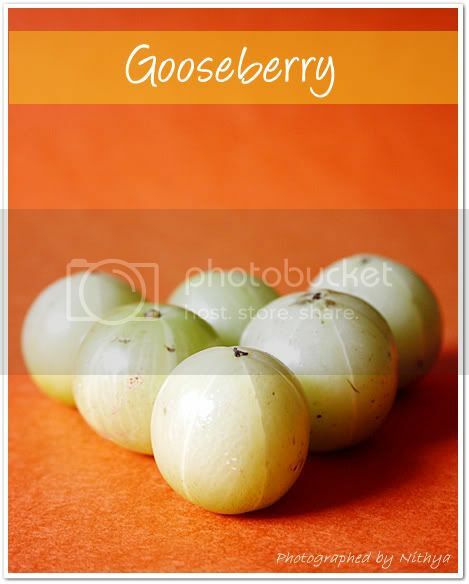 Gooseberry is easily available almost throughout the year and hence this pickle can be made anytime. But the curd factor gives it a short shelf life of max of 15 days if stored in airtight container and left in the fridge. Pressure cook the gooseberries. Cut them along their lines and remove the seed. Now in a bowl, take the curd and churn it well using a whisk. Add chilly powder, turmeric powder, cumin powder, asafoetida and salt to it and mix well. Now drop the cooked gooseberries into it. Finally temper mustard and split green chillies and add it to the pickle. Allow it to marinate for a day. We make a similar one by grinding the gooseberry,looks yumm!! Lovely clicks! Havent tasted it...sounds and looks delicious! Its ok Nithi...do make it next time for my event np! 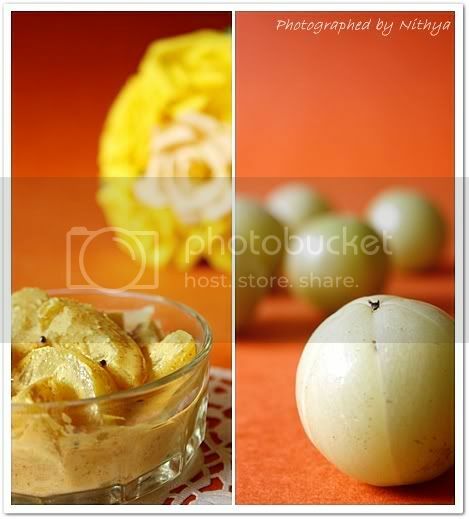 Lovely recipe and wonderful snaps nithi !! ஊறுகாய்ன்னா எனக்கு ரொம்ப உயிர்..அதுவும் தயிர் நெல்லிக்காய் ஊறுகாய் புதுசாவும் சூப்பராவும் இருக்கு..
Wow !! thats sounds so yummy .. I had nvr heard of a pickle with curd before .. Thanks for sharing the wonderful recipe !!! Lovely Nithya! Just wanted to know the shelf life of the pickle? Very interesting! Would love to try! 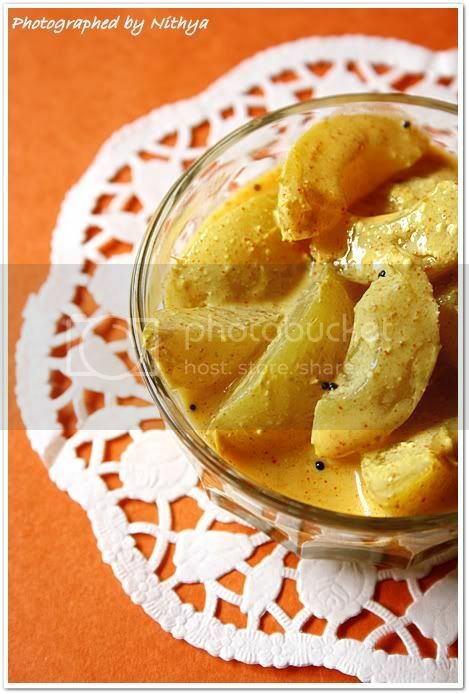 Looks yummy...Awesome clicks too..never made pickles with Nellikai and would love to try this one !! HEy nithi this is very bad. u r tempting me with the items which is not available here, You know often i feel eating goosberries which is my fav one ..now I badly want to have this. Looks so lovely and oooooh tangy !!! I have some gooseberry pickle in fridge which is prepared in different way...this sounds different to me..addition of curds n all..
yummy pickle, awesome clicks, something is waiting for you in my blog. 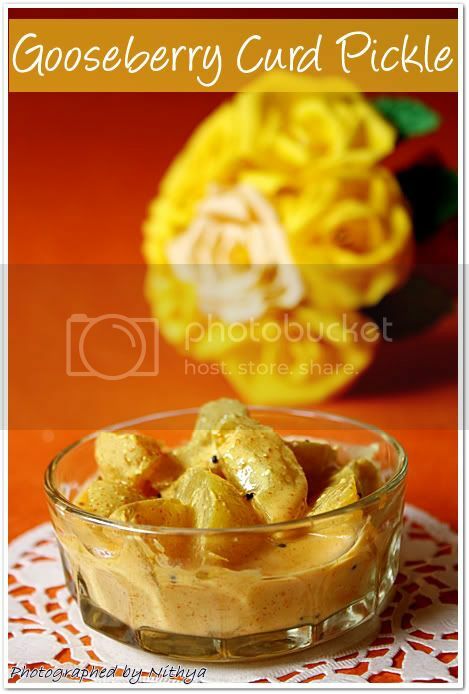 i still crave for my mom's goosebury pickle and this makes me more tempting....looks yummy dear...great click!! Just stumbled upon your blog so wanted to let you know that how much I loved it. Your photography is breathtaking. Looking forward to some tips and recipes from you. Looks so tangy and delicious pickles. Thank you for sharing the recipe! Looks so delicious.